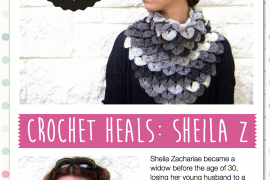 I talk often about the health benefits of crochet. What I haven’t talked a lot about is the fact that sometimes the repetitive motion of crochet can cause or exacerbate hand pain for certain individuals. In most cases, this doesn’t mean that the person has to stop crocheting; it just means that adaptations may need to be made for reducing the pain of repetitive stress. Today let’s look at five of the tools available for crochet-related hand pain relief. Ergonomic crochet hooks specifically sold for the purpose of reducing crochet-related hand pain. There are many different brands and styles so you’ll have to read some reviews and try some for yourself to see if this option works for you. Adding polymer clay handles to your hooks. This makes the hook fatter and easier to grip. 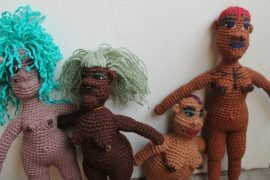 Hooks and Yarns has some instructions for making these. Pencil grips on crochet hooks. Just adding a pencil grip to your hooks can help make it easier to hold them and put less stress on your hands. In addition to the DIY option, you could look into purchasing specific proudcts like the new Easy Hands Crochet Grips being created by Jeanie A. of San Tan Valley, AZ. If you frequently experience pain when you are crocheting then you might find it worth your effort to play around with different types and weights of yarn. Some people find that bulkier, smoother yarn will be easier to work with, requiring less effort from the arms and hands and therefore less likely to cause or exacerbate pain. Many people have told me that it helps to rest their hands on a pillow or a rolled up towel or blanket as they crochet. This helps change where the pressure is placed and relaxes the hands so that they don’t have tension that causes pain. Idea: crochet yourself a pillow that you can use to place your hands on when you crochet future projects! Let me digress for a minute here … I suffer from frequent neck, back and shoulder pain. It has been so bad over time that I have seen multiple chiropractors and regularly gone to massage therapists. I have spent a fortune trying to reduce the pain in my body. I know what the problem is. The problem is that as a writer I frequently spend 8 or more hours per day in front of my computer, typing away on my keyboard. My shoulders climb into my ears, my shoulder blades pull together and I’m often in pain as a result. In addition to the chiropractors and massage therapists, I’ve looked at a variety of products designed to help me with the problem – things like ergonomic chairs and keyboards. I’m not saying that there’s no value to these things but I will say that what I’ve learned over time is that proper self-care is way more useful than anything else I’ve ever tried. When I’m being smart and self-loving, I take ten minute breaks away from the computer each hour to rest, stretch, soothe my body and give it a break. If I don’t do this, the end of the day means pain; when I do it, usually there’s less pain. I think it’s the same way with crochet. If your hands hurt when you work, work in shorter bursts of time. Take time away to set down your hook and just admire your project while you perform small stretches for your hands. Accept that it may take a little bit longer than before to get projects done but that you’ll get them done without pain. I think it’s important to take all of the actions that you can to prevent and repair the problem that you’re having with pain rather than masking it. That said, some people do find that chronic pain requires them to take a painkiller, such as aspirin, in addition to the other actions they are taking. Do your hands, wrists or arms ever hurt from crocheting? What do you do to reduce the pain? Whenever I switch from knitting to crochet, I experience some ache in my left hand. I just know that after a day if it hasn’t gone away, I need to give my hand a rest for a while. I love ergonomic hooks, but since I hold the hook in my right hand, not so sure that helps with the left. Just less poking in my palm. Hm, interesting that making the switch seems to trigger something. Good to know about … sounds like you’re doing the right thing by resting as needed. 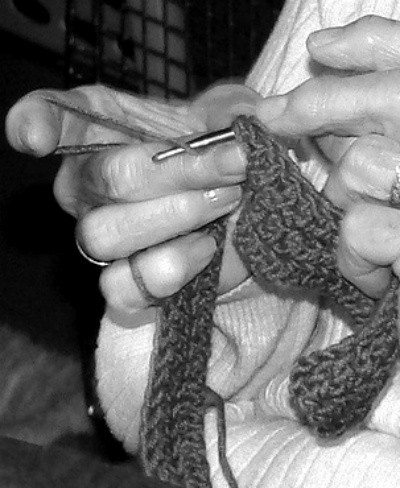 I am interested in any ideas that people want to share to help with wrist and hand pain that occurs when knitting and crocheting. I have a hand injury and am not able to work on things that help sooth me when I am stressed. @craftytjt I believe that there are special gloves that can be worn … have you tried those? I have rheumatoid arthritis and severely splayed fingers on both hands. I don’t have much pain from my right hand holding the hook, but from my index finger on my left hand from holding the yarn. I have learned a modified hold wrapping the yarn around my pinky, under the next finger, and over the middle finger, using my index finger to hold my work as I crochet. Much less stress on that joint. @TammyTaber Thanks so much for the helpful comment. Modifying the method of holding yarn seems to be a key way that people are dealing with hand pain. I really love this video b/c ﻿﻿﻿it REALLY REALLY WORKS on getting rid of shoulder/neck/arm tension. ﻿﻿﻿﻿﻿﻿If you look for “Intro to the Essentrics Workout” on youtube this is what I use almost every day. There’s another one she does for hockey players, but it’s great for us crocheters and anyone who sits all day long as it works the upper legs and hips. No floor work at all! They’re only about 12 minutes long each. my little finger and next finger go numb when I crochet for long periods of time. My chiropractor says it is coming from my elbow. Massaging my elbow helps, but sometimes I just have to put my crochet away for a few days. 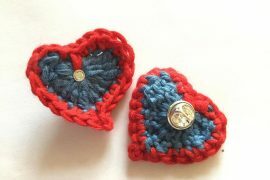 I tried crocheting without bending my elbows so much – haha – I couldn’t do it. So, I try to take long breaks – like 30 minutes or more – every hour – and that reduces the problem. Doesn’t make for fast projects, but we do what we have to do. @barbaramartin1 Yes, taking breaks seems to be crucial – something I do when writing for long periods of time as well. Thanks so much for sharing that – hadn’t thought of that as an option even though I do yoga myself. Thank you for this article. I’ve been suffering severe finger, hand, wrist, elbow, arm, shoulder, pectoral, and back pain since the end of October. I’ve attributed this to knitting and using an iPad and iPod. At times drawing, writing, carrying my toddler, pushing stroller, cutting paper, prepping food for meals, even driving has hurt! I’ve noticed that laying on couch and watching TV with my head turned at a 33-45 degree angle frustrates the pain. As does laying in bed reading. The pain is mostly on my right side, tho my left side sometimes suffers, too. My doc advised me to “not do what’s causing the pain” and has prescribed an anti inflammatory. I’ve only knit about 1.5 hours since the end of October. I’m planning to schedule a second follow up appt next week as the pain continues, even tho I’ve extremely reduced my knitting time and reduced the other activities as much as possible. He took blood to screen for several diseases (arthritis, etc), but that bloodwork came back normal. I do practice yoga once per week, but found certain poses to be non-tolerAble. Recently I wondered if switching back to crochet would help my problems (I crocheted for years before learning knitting). Also I’ve thought about trying. To teach myself to crochet left handed (or knitting in the English style) would help. Have also considered starting to embroider or cross stitch (but think the super small needles would be problematic). I haven’t tried the crocheters gloves, but I will look into that. Ill follow this post with interest to hear others’ tips and stories. Thanks for sharing Beth. It sounds like you’re doing the most important thing which is to pay attention to what your body is telling you and see what aggravates the problem. I need to follow up with Linda to find out if she learned any more from her research into this topic since I first posted it. I’ll definitely continue keeping everyone aware of what potential fixes I find! I am experiencing numbness in my ring fingers from trying to crochet all of my Christmas presents in time. After doing some research I have read on several websites that taking B12 will help. I sure hope it does. I just wanted to mention that I used to get horrible hand and arm pain from crochet and knitting despite stretching, using crafter’s gloves, ergonomic hooks, you name it. I was astounded at how quickly this problem resolved when I began doing Bikram Hot Yoga once or twice a week early last year! Between that and taking more frequent breaks, it is rarely a problem anymore. My friend suffered with cramps badly so I suggested the rollers cut and placed on the handles. This stopped the cramps. Does anyone know of any tools or technics to help with keeping tension on the yarn? I am a young woman who has fine motor difficulties. I recently learned to knit using a loom & always wanted to learn how to crochet. Ergonomic crochet hooks & pencil grips are great ideas when it comes to holding the crochet hook, but I’m struggling to find plausible solutions to help with keeping yarn tension (given my fine motor impairments). I would also be interested in tools or techniques for keeping tension on the yarn and holding the yarn. Due to a nerve problem I lost the use and feeling in three and a half fingers on my left hand. I have not been able to crochet since because I haven’t found a way to hold the yarn and keep the tension on it. My right thumb bruised down to the joint. Actually turned black an blue. Don’t know what to do except quit Kroger for a while. Glad I stumbled across this! My mom has extensive pain from crochet, to the point she took 6 months off from doing it. These days she’s slowing easing back into it. For her just taking breaks and shaking her hand out seems to really help. I’ll look into the ergonomic crochet hooks now.